The Institute of Race Relations (IRR) has published the headline findings of its most recent election poll, finding the ANC in a worse-off position than at the end of last year – while DA and EFF support continues to grow. The February data follows a full poll conducted in September 2018, and a snap poll in December 2018. The group is gauging the current electoral landscape and voting intention ahead of the May 2019 elections. The latest results show the ANC currently stands on 54.7% support nationally, down 1.3 percentage points from December (56%); the DA currently stands on 21.8% nationally, up 3.1 percentage points from December (18%); and EFF currently stands on 12.2% nationally, up 1.2 percentage points from December (11%). 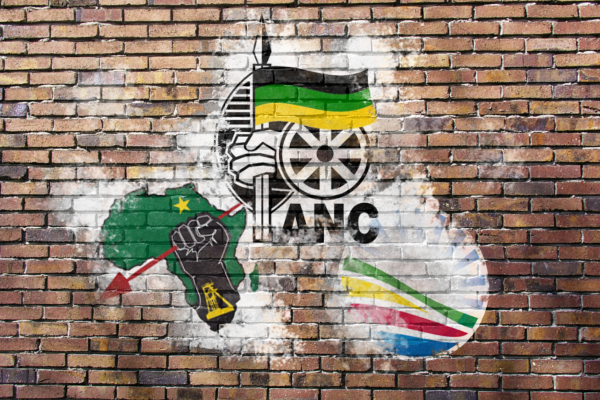 In Gauteng, the ANC is well below a majority, the IRR said, with EFF growth remaining high, while in the Western Cape, the DA majority is on a knife edge, with smaller parties showing some growth. The latest poll was in the field between 12 and 26 February 2019. The sample was fully demographically representative and comprised only registered voters. A total of 1,611 respondents were questioned. The national margin of error is 3.3%. Supplementing this were two fully demographically representative sub-samples for Gauteng (sample size: 502 registered voters) and the Western Cape (sample size: 405 registered voters). The margin of error for the Gauteng sub-sample was 3.8%, and for the Western Cape sub-sample, 5.9%. The confidence level is 95%. The poll was conducted telephonically. The IRR stressed that the poll is not a prediction, but rather a snapshot of the current political climate. According to the IRR, the ANC’s general decline from 2014 (as of February, it is down 7.4 percentage points from the last election) can be almost exclusively attributed to the EFF. “The ANC and the EFF are locked in a battle for between 5% and 10% of alienated black ANC voters. Where those voters end up on 8 May will go some way towards determining the fate of these two parties,” the group said. The EFF appears to be the only opposition party able to make direct and significant inroads into the ANC’s support, the IRR said. The DA, meanwhile, is currently on 21.8%, suggesting it is slowly managing to recover some lost ground (it was on 18% in December), but the party’s internal national election target of 27% is looking far off as of February. “The DA remains relatively stable and its support, it would seem, is locked in a band of between 20% and 24%. Its greatest challenge is the Western Cape which, together with Gauteng, comprised 62.4% of all DA support in 2014,” the group said. The party’s decline in that province (the DA is currently on 50.1% on the provincial ballot) has meant the DA’s primary challenge is getting its base to turn out, rather than to grow in new markets. 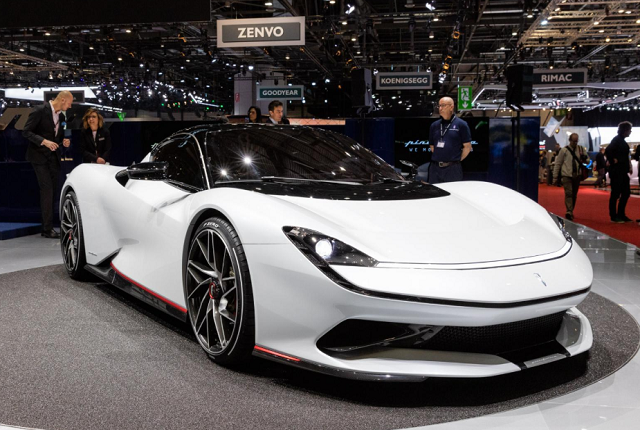 “Its ability to invigorate its supporters in the Western Cape will be one of the key differences between it being able to grow nationally, albeit marginally, and staying relatively stable at around 22%,” it said. 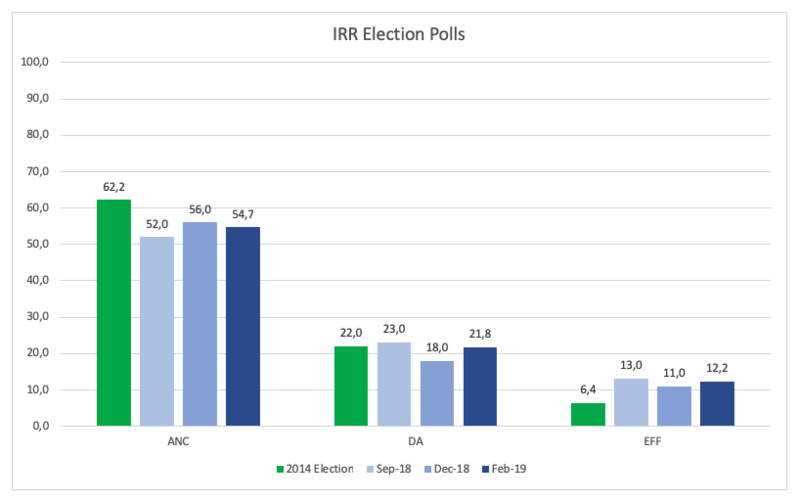 The IRR expects to publish its next full poll ahead of the elections, in April 2019.